The Down to Earth Garden Club annual spring plant sale will be held at BMP, 1263 Maple Ave, DuBois, PA. (Our thanks to Jeff and BMP.) The sale will begin May 18 at 7:00 a.m. until 5:30 p.m. The hours May 19 will be from 8:00 a.m. to 2:00 p.m. Please do not ask that plants be held without payment. We will hold paid for plants at the buyers risk. We will not sell plants outside the stated times as the volunteers are busy setting up or tearing down. Currently, there are about 900 perennials in inventory. Most of them have spent at least one winter in the pot. All are hardy and will grow in the DuBois area as that is where they were grown. They come from DTEGC member’s gardens or were donated by friends of the organization. The list can be found at www.downtoearthgardenclub.com and will be updated as the inventory changes. There are always last minute surprises that don’t make the list or plants that aren’t nice enough to be put in the sale. Proceeds go to maintaining the gardens at the DuBois Public Library, the Reitz Theater, City Building, and the Pershing Parking lot. There are also various pots and window boxes around the city that require annuals, soil and fertilizer. The club also has a three tiered butterfly bed on the Beaver Meadow Walkway and several small beds in that location. The various flower beds on the embankment at the foot of Liberty Blvd are also a club project with the bed located across from Harley -Davidson currently being planted as a sanctuary for pollinators. The teaching butterfly bed at Parker Dam has been cared for by the club for many years. It contains only native plants that are specific host or nectar plants for native butterflies. 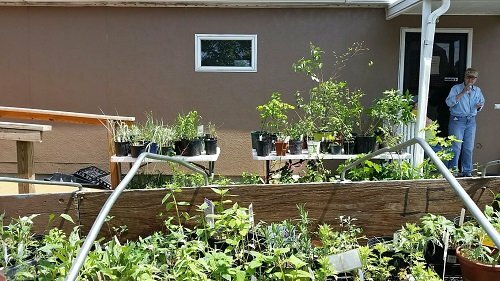 The group also provides plants and assistance to schools and other non-profits that need information and help in planting gardens. The goal is to increase the number of gardens in our area and to educate gardeners in the ways of plants and the need to provide food and homes for butterflies and pollinating insects. We aim to make DuBois beautiful.